I want to keep my hands busy and create something, anything. I want them to work like a spider creates a web and cast a net of protection across everyone I love. I’m safe and yet I can’t help but think of my neighbors, my friends, and even the strangers who sought water along with me at the Winn Dixie. I think of the habitats: my own–yes–but also the egrets’ and the spoonbills’. I think of the cardinals that visit my feeders. The turtles who laid eggs on the nearest beach. I sit in my car 773 miles from home and I watch a Georgia peach sunset. So warm and giving and yet the same air that breathes a hurricane. All I can do is knit: Prayers, wishes, surrender. That’s what I saw outside my bedroom window this morning. I think there were probably more, but the flock flew away before I could finish counting! I then crawled back into bed to hopefully sleep off the bug that is making the rounds. I’m up finally, feeling much better, and my Fitbit says I slept sixteen hours! Today is brought to you by the number sixteen. I’ll let you numerology people unravel that one. 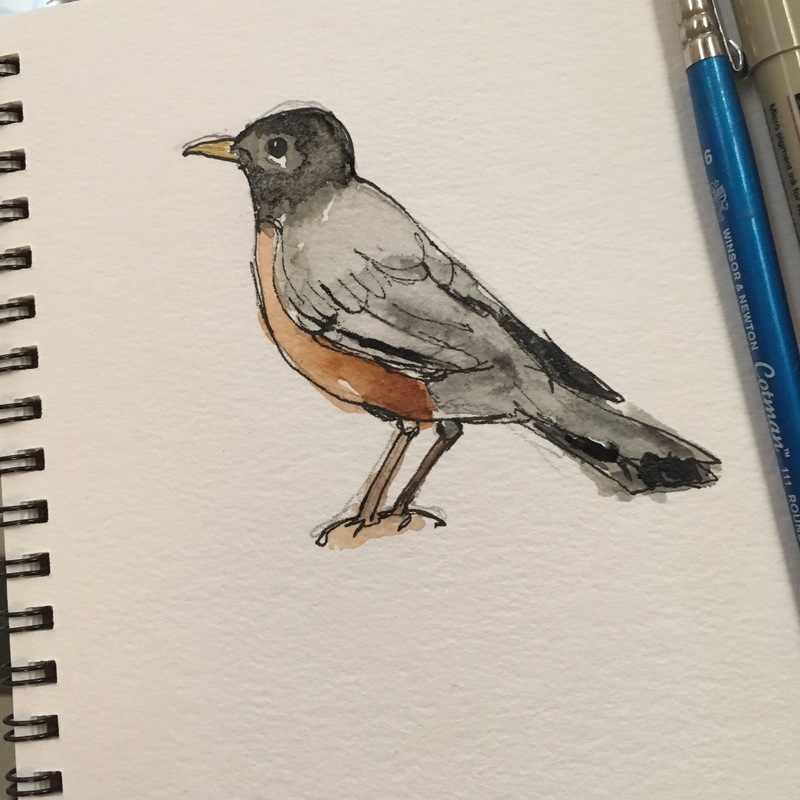 Now for some watercolor sketches of robins. Spring is upon us, friends. The neighbor’s pine tree was removed today. It stood several inches away from our property line. But it felt like my tree. The large crew of workers cheered when the tree came crashing down but I stood and cried. Oh I had plans, all internal mind you, to talk to our neighbors about my their tree. They told my husband they were planning to remove it because it was too messy. I was going to tell them about the woodpecker that lived in the tree. I tried to imagine their faces when I told them to save the tree for the birds, and well, I kept avoiding the conversation. And now my tree was gone, rolled away in an orderly pile of mulch. The pine tree that is no more. It is the tree pictured behind the bird feeder. Sniff. Why am I fretting so much about the tree? It’s not the tree. I know this even though all I want to do is rant about the tree. No, I am crying for all the damn pine trees that have fallen in my life without my permission, disrupting the peace of my birds, leaving me helpless to fix. As if there was ever any fixing to be done in the first place! Instead I will go for a run. I will drink a cup of hot tea even though I want coffee, because goodness knows more coffee will only make my heart quicken and I don’t need that. I will fold laundry. I will pick up messes. I will write–first a dark poem about my tree on my private blog nobody knows exists (I will spare you the poem) and then this post. I will yell at the beagles when they find half a churro in my purse, and this sentence alone will make me laugh out loud for the first time since the tree was felled. Then I will chuck the churro away in the trash when I discover it is covered in ants (alas, I do live in Florida after all). Finally, one problem I can fix. I will put away some dishes. I will drink more tea and keep avoiding coffee. I will let myself cry at the bright sun pouring down on grass where a tree once stood even though I know it’s not about the tree. Don’t worry – the reason to frown will also make you laugh. Stick with me. 1. the Canadians are back! the Canadians are back! Our Canadians (that’s what we call them) who live down the street have returned from Montreal. They have a huge, sweet brown dog named Buddy. They are polite and their country’s leader is Justin Trudeau. I want them to adopt me. 2. My daughter’s preschool had a thanksgiving lunch today (aww!) and the kids sang us songs. It was super cute. One staff member made a huge rice krispy treat dessert shaped like a turkey. It sounds weird, but It. Was. Awesome. 3. 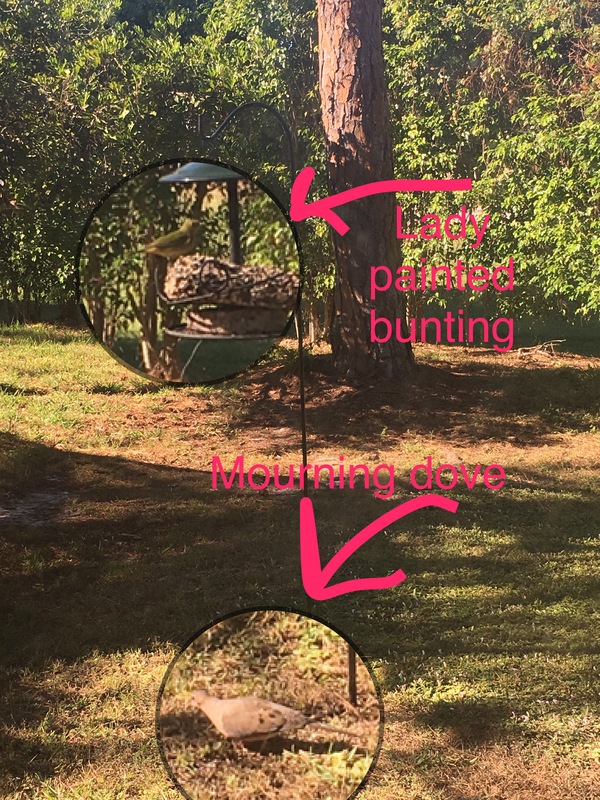 My painted buntings are now friends with my mourning dove. IS THIS REAL LIFE?! Thankfully I see my hairstylist Monday. She may or may not tint my brows which is technically not allowed in Florida (we regulate eyebrows more than gun purchases), but she takes care of me. Actually this is a reason to smile. When a male painted bunting feels threatened it sings out a loud, clear, beautiful song from its perch, all the while dazzling in a bold palette of red, blue, green and yellow. You can do this too. When facing darkness and fear, dare to show your bold colors and sing your beautiful song. Sing it into the void. Pierce the darkness. Display your beauty in an act of radical love and joy. *A female and male bunting have been visiting my feeder this week. Highly unusual for my location in Florida. They aren’t even scared away by my loud three year old or my barking beagles. Can you believe it? It all defies logic and makes my heart sing. These birds fill me with such joy and hope! 1. My three-year old calls ginger ale “gingerbread” soda. 2. 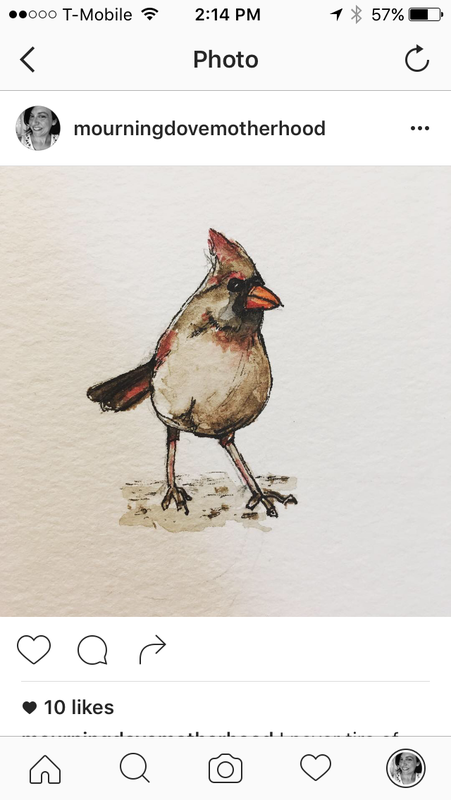 I painted a bird. 3. A whopping 20,000 people have donated to Planned Parenthood in Mike Pence’s name. You may now carry on with your Thursday. Two days in a row now I’ve sat down in the morning with my coffee and an intention to write…and two days in a row I have decided to draw and paint instead. Either way, a very good way to start the day, and I am grateful for that! I am sure the words will return soon. I created this little Florida scene and thought I would share with you all. It features (one) of my favorite little birds, the Ibis. These cool little birds are common place where I live. Isn’t that just amazing? Not exactly a bird I saw growing up in the Midwest, I will tell you that! Anyway, ibises are a hoot to watch. They typically travel in groups and peck at the ground looking for bugs. It isn’t uncommon to see a group of ten or twelve of them crossing the yard en masse. They make themselves quite at home, too. They don’t seem to mind sharing the space with the odd squirrel or a few mourning doves. Well, with one exception. Beagles. They are spooked by two old, loud, barking beagles running toward them, and I certainly can’t blame them for that. Update: after posting I went outside and what did I see but a small flock of ibises! Well played, universe. Maybe mama cardinal is busy dealing with the rambunctious toddler cardinals. Who refuse to let you comb their hair. Please for the love of baby cardinals, let me comb your beautiful hair. Remember when you were little and would comb your baby doll’s silken hair with a little pink plastic dolly brush…wasn’t that fun? Doing your three-year-old’s hair is nothing like that. If nations were like three-year-olds we wouldn’t need nuclear weapons. All we would need are purple no-tangle brushes that we could whip out at any time as threats and send them running. My daughter has curly, frizzy hair that is as wild and free as her personality. I must approach her like a feral horse, with low monotone cooing and sugar treats in my hand. There will be a day where she will be hogging my bathroom, twirling her hair with some type of heated curler device for hours on end. It’s hard to imagine it. Until then, you can find mama Cardinal and me busy behind the scenes. Tending to our fast-growing baby birds. I eventually got out of bed. I had to—the little girl needed to get dressed and fed and cajoled into getting her mop of curls combed. I have reason for not wanting to face the day. My sister has a hard day ahead with a medical procedure. A lot of unknowns. Unknowns are the worst, the worst! I’m anxious and worried and fretting and pretty pissed off that there is nothing I can do to make it all go away. As much as I wanted to remained curled in a ball, hiding under the blankets, I faced the day. I got up, dressed and readied the child for daycare, made the coffee, and sat down to say a prayer for my sister. So here I am. As soon as I sat in front of my computer a bird began a beautiful song. It lured me onto the back lanai, and I hoped I could get a look at creature. Well, it stopped. Bashful, I guess. None of my usual feathered friends have a song quite like this one. It was really quite lovely. It lifted my heart and for that I am glad. It made me step outside and breathe in the fresh, damp Florida air. My sliding door to the outside is now ajar, and the noises of animals and creatures puttering about is filling my space. I will face the day, outside of the bed. Heart in ‘Cago. Keeping an eye and ear out for that bird. UPDATE: everything went really well for my sister. Phew. Very much relieved.